Make her eyes sparkle in just three steps. As unique as your union, as lasting as your love. 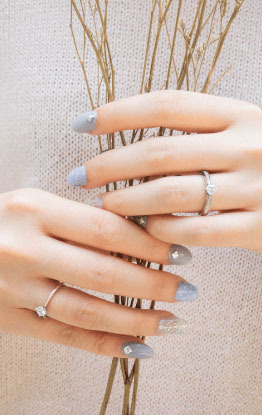 Tips: How to find Her ring size? Tips: Get a ring within your budget! Was very impressed by the service rendered by Charme, as well as her product knowledge and detailed explanations. Will be back for my wedding bands! Great place to get ur wedding rings, great value n service. The experience of purchasing a ring from Michael Trio is simply wonderful and their service were excellent. I was served by Charme, who was knowledgeable, patience and willing to share her opinions. More importantly, my fiancée loves the ring and the price was reasonable. When I first came in to Michael Trio, Charme has displayed exemplary customer service, showing me the basics of choosing a ring and prioritizing the customer's expectations. Value-added experience!! One of the better place to get your engagement rings. Customer experience was good. After sales experience is just as good. Worthwhile shop to look for your items. Pleasant shopping experience overall. Charme has been helpful throughout the process. Great value for money. Got our engagement ring and wedding bands from Michael Trio. Superb quality with reasonable prices. Highly recommend anyone looking for jewellery to pop by Michael Trio. Highly recommended! Staff was well knowledgeable in their products. Was attended by Charme who pay great attention to details and patience. She is willing to share her opinions and advice too! Wayne gave us a good run down of how to choose rings in general. We are very happy with our choice of wedding bands. We love the rings. Michael Trio has many designs available for wedding bands. The service was excellent. Charme was patient to assist to select the rings that we like. She shared with us many tips on how to take care of our rings. After visiting so many Jewelry stores, I decided to place orders with Michael Trio on the first visit. Reasons: reasonable prices, excellent services, professional advices and most importantly solid products! Was attended by cheerful Charme who is Super patient and attentive to our concerns. Offered helpful advices and opinions too!